The 21st International Conference on Cultural Economics to be held at University for Lille, France, Tuesday June 30 – Friday 3 July 2020. The Call for Papers will be released later this year so stay tuned for further details. In the meantime, please note the following about #ACEI2020 Lille. The conference theme will be cultural policy with key note presentations and special sessions involving cultural institutions and policy makers to discuss this topical area. Digitization have changed the cultural sector in many ways. There are new products, new way of consuming, new business models, new way of funding (e.g. public-private partnerships), calling for new ways of doing cultural policy. The fast changes characterizing the cultural sector call for new research in cultural economics to understand and provide guidance for cultural policy. As usual the conference will welcome paper presentations from a broad range of topics relevant to cultural economics. 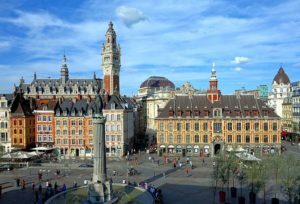 The city of Lille is at the center of a large metropolis, the proper term is a “conurbation”, where live more than a million and a half people on both sides of the border with Belgium. People are clearly marked by the placement next to a border that makes the city openly European. In Lille, you are about one hour by train from three major European cities: London (1h20), Paris(1h) and Brussels (1/2h). Amsterdam is not much further (2h58). As soon as you get there, you can feel very strongly that Lille is the old capital of Flanders in many ways: the heritage is marked by almost a thousand years of history, and as soon as you are seated in the old town, or even more in the breweries or monasteries around, the flavors of food and beverages … are inspired by a common culture. The craft brewing of beer has spread everywhere for ten years, but Flanders have a lead over 300 years old that no one else is anywhere near catching up. Many typical dishes come from neighboring countries or just opposite like Belgium or Wales. Cultural identity is very marked by two very different things. On the one hand, you regularly feel like you’re getting into a painting by a 15th century painter, like Dirk Bouts, for you to appreciate if it’s hell or paradise (what you prefer, especially if you eat and drink of all these blessed non-healthy things). On the other hand, the industrial heritage is very important, with mainly the textile whose epicenter is in Roubaix and the mining basin which describes a gigantic semi-circular circle of 100 km around the city. The contrast of the extreme wealth and brutal poverty directly derived from capitalism of the last two hundred years can be read directly in the works of the architectural heritage. On the side of the rich, the most expensive houses in the world of the barons of the industry as the villa Cavrois and the side of the poor, the response of the public order has proposed a ‘revenge’ in the form of masterpieces some of the greatest architects, such as Le Louvre Lens. Is this this ancient violent contrast that gives the metropolis its dynamism today? who knows … the museums, the national scenes, and the large stadium Pierre Mauroy retractable roof, not to mention the hotel facilities, are almost always examples of architectural virtuosity which probably contributed to the appointment of the metropolis as World Capital Design in 2020, at the same time as our ACEI2020.